Inspired by our respect for tradition, Sam & Wishbone's Flower Collection offers a selection of beautiful flower ornament designs, embellished with crystals. Stunning floral ornament printed on smooth pillar candles and embellished with sparkling crystals. 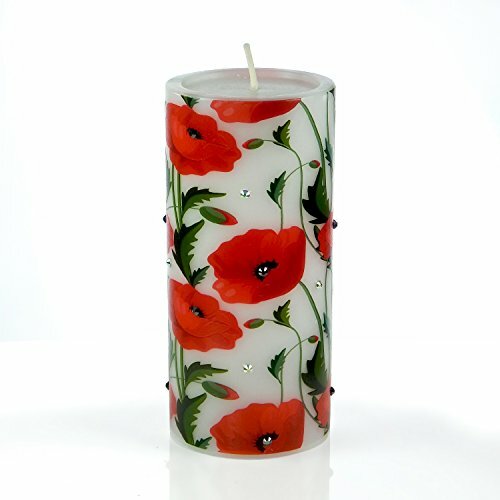 Stunning floral designs printed on smooth pillar candles. Great for Home-Decoration. Unique High-end printing on a Candle. Hand Embellished with Rhinestones. Limited Edition Designs will make Fantastic Birthday Gifts or Mothers Day Gift. Unscented Candle. Add any fragrance oil to fit your mood. Candle burn time approximately 60-80 hours.